(Newser) – George Zimmerman is being held in a Sanford jail until he posts bail, and the Orlando Sentinel gives an inside look at his conditions. He's under protective "administrative confinement" thanks to the level of media attention on his case. He doesn't get to watch TV or use tobacco—but he's got a supply of Jolly Ranchers, Nutri-Grain bars, and Tostitos he bought from the commissary, using money donated by his visitors. He also has access to the jail's books and magazines. He gets three meals a day, at 4am, 10:30am, and 4pm; he's also allowed three hours of recreation time per week. Click for the whole breakdown. 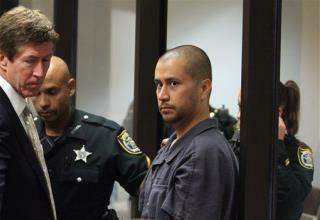 no matter what you think about this case, and no matter who raised him, zimmerman is NOT white! I live in Sanford, Florida, and I'm a white woman, for the record. Stand Your Ground is here to stay. Now I know which corporations are supporting it, and in turn, I will support them. I also now know which corporations backed away from supporting the SYG, and I will no longer support them by giving them my business. I live in Sanford, and because of this unreasonable reaction to this event, I finally got around to applying for my concealed weapons permit, and am taking classes at Shoot Straight to make sure that if I need to use the weapon, I'll hit my target without fail. If this neighborhood watch captain were black, I doubt Jesse Jackson and Al Sharpton would have flown into my neighborhood and organized a rally at Fort Mellon Park. No one would have given a damn about Trayvon Martin had he shot by a black man. Not ONE person would have complained. See, it's OKAY if a black man chases down another black man, shoots him dead, and then lies to the police, stating he was standing his ground. THAT'S acceptable, and no tears are shed, and it's not an outrage. The killing of Trayvon Martin was not an outrage in itself -- it's the fact that a non-black was on the other end of the gun. The protesters weren't protesting because they cared about Travyon being a 17-year-old coming back from the store with candy, and it's outrageous to kill an unarmed teen. They protested because a black person didn't do it. If George Zimmerman were black, this wouldn't have even made the news, even IF he claimed he was defending himself. It just doesn't matter to me, this case. I have no sympathy for any of these people who rally for this cause, including some friends of mine that I DROVE to the rally at Lake Monroe. All that for a non-Sanford-resident? Why? Black teens are shooting each other up in parts of Sanford every day! None of the people at this rally EVER tried to rally or start a movement to stop the young black male population here from perpetuating so many crimes that involve using deadly weapons. Just look at the crime logs for the City of Sanford, and look at the photos for these crimes. It's almost entirely black. The city is 52 percent white. So why aren't the photos of the people in this jail half white? This is FACT. It's because the surrounding cities in Orlando (Sanford is only one of them) have about 20 crimes commited for every 500 that Sanford has! Just look at the internet sites that show you the crimes committed here, which neighborhoods/streets they're on, and look by icon for the robberies, burgularies, weapons arrests, etc. That will show you, in full color, a map of Seminole County and what percentage of crimes are committed by Sanford WITHIN that county. But NO ONE that lives here, black or white, ever had a rally to stop the rampant crime in Sanford, including the shootings that have these kids end up dead, and they're ALL giving excuses that they didn't do it, they were protecting themselves, they were threatened.... and no one said BOO until what they originally, for days, THOUGHT was a WHITE guy pulled the trigger on a black guy. When they found out he was Hispanic, they were (trust me, I live here!) just a little bit embarassed at how they made statements publically about blaming a "white" for what they had already determined was a HATE crime of white on black. Now it seems a little watered down for the Cause to say it's a Hispanic-on-black hate crime -- doesn't have the same "punch," does it. But they're going with that now, albeit it's not as outrageous of a scandal as a white-on-black execution. Now there are rallies... people flying all over the country to protest. Congressmen donning hoodies at venues that I'm sure have a dress code for a suit and tie ONLY -- not hoodies, clown suits, ballerina tutus, or hotpants. They pressure these men with phone calls demanding their support, and likely with the unspoken threat that they will lose the black vote if they don't publically support the Cause. So, what IS the cause? Is it that a young, black, unarmed male was outrageously followed through a subdivision and shot while walking home? Or was it that a non-black had the AUDACITY to become suspicious of and follow a black male who was unknown to that neighborhood, walking slowly in the rain and looking around, wearing the traditional thug getup of every convenience store robbery every perpetuated within a 30 mile radius of Sanford? I know have the right to wear what they want, but like every decent mother tells their young daughter: Dress like a whore, they'll treat you like a whore. How many nerds get beat up for dressing like one? How many people didn't get jobs because they didn't have a decent suit on? It's unrealistic to suggest that the way you dress does not INFLUENCE people, positively OR negatively! I'm not suggesting that if people DO dress as such that anyone has the right to violate them! But claiming Zimmerman had the AUDACITY to look at Trayvon Martin and follow him, and the nerve to think he might be one of the thugs that plow through the Sanford streets on a daily basis looking for someone to rob or burgle? That's just a little too much to expect from ANY person with a head on their shoulders. But that's what they're REALLY angry at -- NOT that he was shot and unarmed. But that a black male, sauntering around, in a thug outfit, and reaching into his waistband, is not looked upon by society the same as a non-black male sauntering around in jeans and a polo shirt, reaching into his waistband. I'm sorry, but I also think a man in a suit is less threatening than the man who is wearing jeans shorts and t-shirt! Who gave that kid permission to go out that day and go visit people? And who told him he could take a nice long walk and go buy snacks? Who was supposed to be watching him or checking up on him as well, since he WAS on a 10 day school suspension and shouldn't have been enjoying ANY of that "time off." Was it THAT normal for Trayvon to not come home all night in a neighborhood where he doesn't even LIVE? Who goes to bed when they get home if they see a suspended boy never got back from the store hours ago, and actually SLEEPS the whole night through and leaves calling the police for the NEXT day? The same people who allowed him to get multiple tattoos and gold gangsta teeth at the age of 17? And the hoodie, that completed the perfect "Im a thug" persona? THOSE are the people who are ultimately responsible for that boy's death. They didn't push him over the cliff.... but they brought him RIGHT to the EDGE of it. Take away the grease, And put him in A-Tank for a while to get broke inn.They want mine him standing his ground.